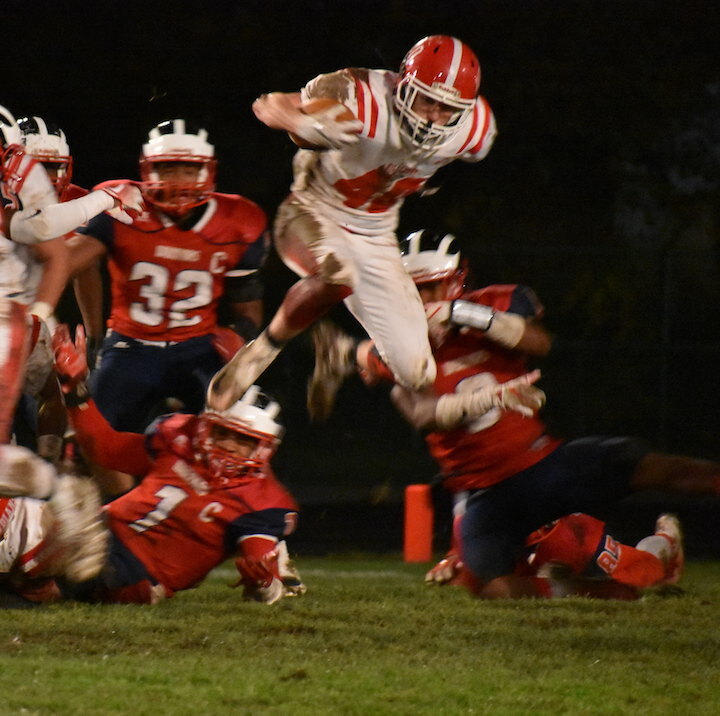 COLUMBUS — The Hillsboro Indians’ memorable season came to an unfortunate end on Friday night in the 2018 OHSAA Division III Regional Quarterfinals at Eastmoor Academy High School. Playing against the No. 4 seeded Warriors of Eastmoor Academy, the Indians — a No. 5 seed — led at halftime, but the second half didn’t have the same momentum with the Warriors scoring on the first drive following halftime and they never looked back as they defeated Hillsboro, 34-14. Hillsboro ends the season at 9-2 overall, as this was their first playoff appearance in 13 years. Hillsboro not only played in the playoffs for the first time since 2005 this season, but they also won a share of the Frontier Athletic Conference championship, as they hadn’t won a conference title since 1998. “We let [Eastmoor Academy] have some big plays. We missed some tackles, and we didn’t take advantage of our own turnovers that we caused,” Hillsboro head coach Jack O’Rourke said following the game. “They came to play the second half, and we didn’t come to play as well. They were penetrating on our offensive line, and they made some adjustments at halftime that we weren’t prepared for. 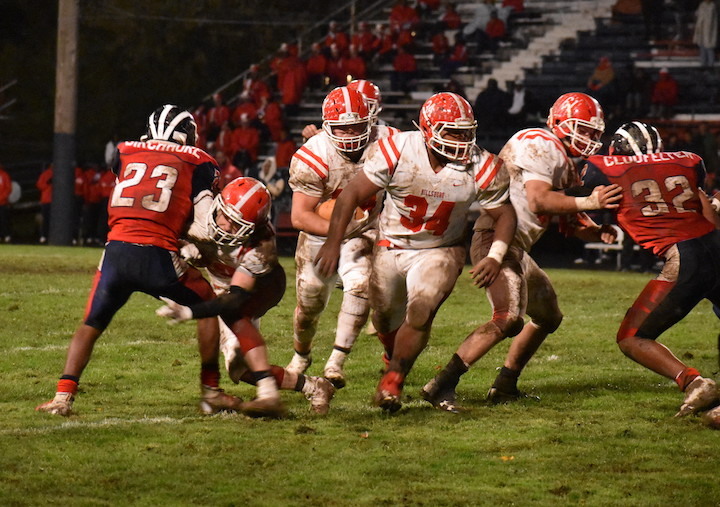 Playing in very muddy and not-so-great field conditions, the Indians trailed early on by a 6-0 score as Eastmoor (10-1) was first to score a touchdown in the playoff game. Savon Edwards Jr. reached the end zone on a 79-yard drive that resulted in six points with 2:05 left in the first quarter. The PAT was no good, leaving the Warriors’ lead at 6-0. The Indians put together their first scoring drive starting with 8:33 left in the first quarter by opening the drive from the Eastmoor Academy 35-yard line. The first play was a two-yard gain by Deon Burns, followed later by two big runs by Josh Keets for gains of 13 and 12 yards. Three players later on third-and-goal from the 4-yard line, Burns pounded that distance for a 4-yard score with 5:34 left in the first half for a 6-6 tied score. Later, a 2-point conversion run by Mason Swayne left the Indians in the lead at 8-6, which stood when halftime arrived. Hillsboro forced a fumble and then recovered to put a halt to the drive by the Warriors in the second quarter. With 1:15 left on the clock following the forced fumble, the Indians got to a second-and-4 play from the EA 29-yard line and went to the end zone on a pass from Swayne to Luke Middleton, but an illegal shift penalty negated the score, leaving the Indians in the lead by just two points instead of eight at halftime. The second half saw the Warriors take the lead on the second play of the third quarter with a touchdown run through the middle of the defense by Miicah Coleman for a 35-yard score. The PAT was good, leaving Eastmoor Academy in the lead at 12-8. Hillsboro had a turnover on downs in their ensuing drive but regained possession with a forced fumble by Max Conover and recovery by Burns with 7:06 left in the third. The Indians failed to take advantage of the play, as they later were forced to punt. 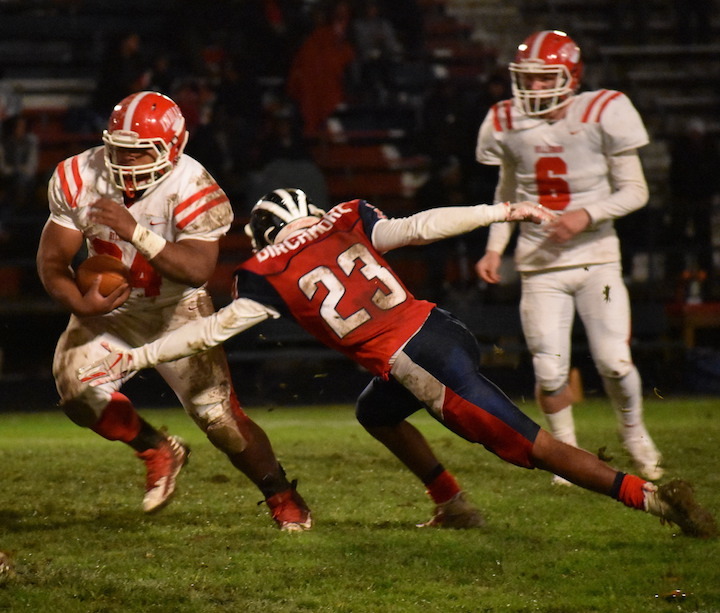 The Indians forced and recovered another fumble on the next play, but once again, the Indians didn’t score points in gaining the football from the 13-yard line of Eastmoor Academy. After gaining possession of the ball, the Indians gave the ball right back with an interception by Napoleon Harris who caught the tipped pass with 3:44 left in the third quarter. This time, the Warriors took advantage of the Indians’ miscue with a four-play drive that saw six points scored on a 6-yard run with 2:46 left in the quarter. The PAT was good for a 20-8 score. Three plays later, the Warriors had another interception, this time taking the ball to the end zone by Edwards Jr. with 2:46 left in the quarter. The PAT was good for a 27-8 lead over Hillsboro. HHS worked to get back into the game, including a 37-yard rush by Mark Gallimore on a third down play. The Indians eventually worked their way to the Warriors’ 9-yard line but were stopped on fourth-and-2 for a turnover on downs with 9:45 left in the fourth quarter. Eventually, Eastmoor added another score, this time on a 47-yard play off a pass from Marquise Laster to Cameron Long for a touchdown. Again, the PAT was good for a 34-8 lead. The Indians had one last scoring drive left in them for the season, as their final scoring drive included a 25-yard pass from Swayne to Gallimore, taking the ball to the 50-yard line. Next was a 9-yard gain by Keets and then a pass completion to Burns. The drive ended on a 33-yard rush by Swayne for a TD with 2:17 left in regulation, leaving the score at the final of 34-14. HHS did recover an onside kick as Reece Bloomfield came up with the football, but the game all but officially ended with an interception by Eastmoor with 33 seconds left on the clock. “We came further than anybody thought we would,” O’Rourke said. “I was very proud of them, and I’m very proud of the effort they gave throughout the entire year. It was a spectacular season for us. They kept after it. Hillsboro, ever consider joining NFHSnetwork.com? They broadcast live high school sports from around the country. I think you just need somebody (Hillsboro HS or Highland County Press) willing to stream your events. They get saved so anyone can watch them any time, even a few years later. I watched my Ottawa Lake, Michigan, Whiteford bobcats win the Michigan Division 8 state championship last year and several playoff games leading up to it. They lost the quarter finals last Friday so they're out of the running this year. It only cost me $9.95 for a month long pass. Whiteford is not a member of the NFHSnetwork so their regular season games are broadcast but all the state contests are broadcast as the other schools must be members. The state finals at Ford Field in Detroit are all broadcast. I looked and neither Hillsboro nor Eastmoor Academy are members. If one of you were members then the game would've been streamed and also available for later viewing. Or if some organization (Highland County Press or some local radio station looking to expand) would be interested in streaming then it would really be something to bring interest to your program. It's nice to read all about it but it's really great to be able to WATCH the game. Just thought I'd mention it. I'm going to watch the team that beat Whiteford this Saturday. That team is the Reading Rangers from Reading, Michigan. They will play Southeastern from Detroit and the game will be at Reading on 11-10-2018 at 12:20 PM EST. Last Friday their field was very muddy. Maybe it will dry out by this Saturday if they don't get any more rain. This comment has been hidden due to low approval. Congratulations, Coach O'Rourke and the 2018 Indians. You were a lot of fun to cover this year. That senior class will be tough to replace. This comment has been hidden due to low approval. GO BIG RED! This comment has been hidden due to low approval.